No need to ask "trick or treat". 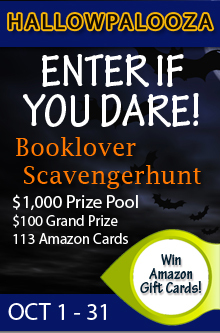 As one of the sponsors of the Night Owl Reviews' HALLOWPALOOZA Scavenger Hunt, I'm here to help you find some great books to read on those stormy nights when you're all alone at home. During your hunt for new reads (maybe a prize! ), make sure you check out my featured title, Eidolon. The HALLOWPALOOZA grand prize is a $100 Amazon Gift Card. The total prize pool is $1,000 with 113 winners. Enter now over at Night Owl Reviews!